Water is a scarce resource in India, especially in the state of Maharashtra, where most rainfall is limited to the monsoon season from June through September. The Government of India has long promoted a Participatory Watershed Development (PWD) approach to deal with this scarcity, focusing on technical and social interventions to restore barren landscapes, boost agricultural production, and improve livelihoods. The PWD approach is now facing a major challenge: climate change. Over the past dozen years, India has experienced four major droughts. This past year, the state of Maharashtra received only 82 percent of its average monsoon rainfall; some districts received only 25-50 percent of average rainfall. For agrarian villages located in arid and semi-arid regions of Maharashtra, any small reduction in rainfall can compromise agricultural yields, drinking water supplies, and, really, the community’s entire existence. In the face of unabated climate change, reductions in monsoon rainfall are likely to become increasingly common. But there are solutions. The Watershed Organisation Trust (WOTR) is one organization that’s exploring ways to safeguard livelihoods in these regions in the face of changing environmental conditions and increasing water shortages. WOTR has been actively implementing PWD projects in India since the 1990s. In Maharashtran villages like Wankute and Kumbharwadi, severe soil nutrient depletion, erosion, and water scarcity prevented villagers from cultivating more than a single crop during monsoon season—usually pearl millet or pulses. As a result, villagers were forced to work as migrant farm laborers or in sugarcane factories for the remaining six-to-eight months of the year. WOTR helped develop the villages’ capacity to trap rainfall and replenish surface and groundwater using natural landscape treatments, such as farm bunds, hillside terracing, planting of native trees, and water and fertilizer budgeting. Villagers contributed their time and labor to install these landscape treatments and agreed to keep livestock from grazing on recently planted areas. What Is Participatory Watershed Development? PWD is a community-based approach that aims to enable rural communities to revitalize their natural resource base and the local economy. PWD treatments or interventions include rainwater capture infrastructure (e.g., farm ponds, check dams), soil erosion control activities (e.g., farm bunds, afforestation), capacity building and education efforts, female empowerment, crop planning, and biodiversity and ecosystem conservation. Today, both Wankute and Kumbharwadi are green with tree-covered hillsides and year-round crop production. Farmers now grow monsoon (kharif), winter (Rabi), and summer crops, and crop yields have increased due to irrigation and improved soil quality. In meetings with farmer groups, villagers proudly state how their children now have enough stability to stay in school—even through college. Plus, women are more active in the community: They are earning their own income through livestock operations and have created 25 all-female “self-help” groups, which serve as micro-lenders in the community. The drought this year, however, presents new challenges for these villages, as well as potential setbacks to their development success using PWD. Wankute and Kumbharwadi farmer groups have expressed concern that the recent drought will reduce their agriculture yields and income. If the trend continues, some families might have to seek work outside the village again, and they’ll need water tankers to supplement drinking water supplies. WOTR is now working with villagers to adapt to these obstacles, which are likely to become more significant as global temperatures continue to rise. To address some near-term climate risks—specifically drought and weather fluctuations—WOTR is employing a Climate Change Adaptation (CCA) project. The initiative focuses on both expanding watershed development interventions to promote sustainable land management and providing new resilience-building strategies. 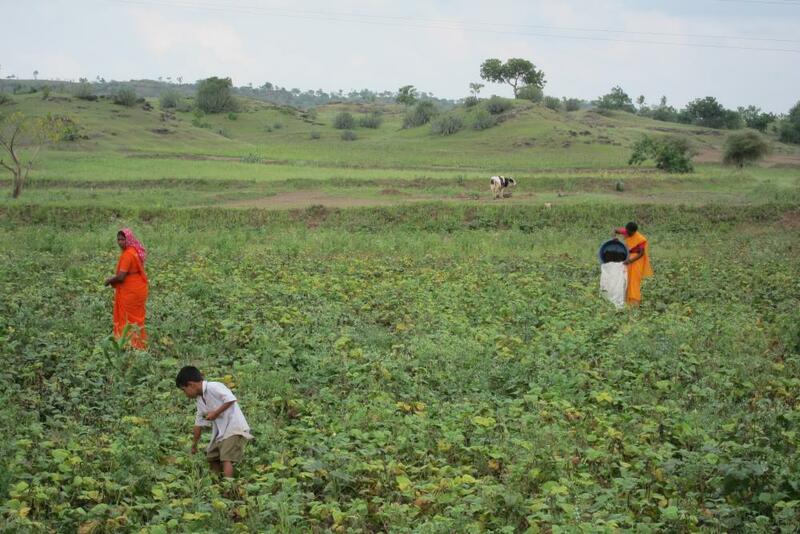 WOTR’s CCA project is currently being implemented in 53 villages across three states in India. CCA interventions include water-budgeting techniques and technologies (like drip irrigation and planning for a variety of water needs), agro-meteorology installations that provide frequent and timely weather reports to villagers, agricultural intervention planning, livelihood diversification, and biodiversity and ecosystem conservation. The organization also promotes the use of solar energy devices for cooking and lighting--the former is particularly effective in conserving trees. In addition to helping villagers contend with an increasingly unpredictable climate, these treatments provide multiple ancillary benefits, such as habitat conservation, carbon sequestration, improvements in air and water quality and human health, and reduced soil erosion. The situation in Maharashtra mirrors what an increasing number of rural communities are facing in regions all over the world. Due to changing environmental and climatic conditions, many communities must alter the practices they’ve relied on for years in order to safeguard their livelihoods. Additionally, these communities must protect and restore the fragile ecosystems on which they depend and which are important to ensuring their resilience to changing conditions. WOTR’s approach has the potential to provide valuable climate change adaptation lessons both for rural India and for semi-arid and arid regions across the globe. WRI is currently working with WOTR to analyze the costs and benefits of a PWD approach and the use of climate change adaptation treatments to manage risks. As the Government of India moves forward with its watershed development programs, this collaborative work will hopefully shed light on how to protect rural livelihoods and determine which watershed treatments and technologies should be promoted in rain-fed agrarian villages across India.